February 4, 2012 - Spirit Airlines, which it likes to bill itself as offering ultra low airfares, has tacked on an additional $2 dollar fee to its ticket purchases in the name of new DOT airline consumer regulations. - Include all mandatory taxes and fees in a ticket purchase and must be visible to the consumer. - Require airlines to refund baggage fees if they are lost. - And requires airlines to promptly notify passengers of flight delays over 30 minutes, as well as flight cancellations and diversions, and they will be generally prohibited from increasing the price of purchased tickets. In retaliation Southwest Airlines, Spirit and Allegiant petitioned the U.S. Court of Appeals for the D.C. Circuit to void DOT?s new rules that would require advertised prices include government taxes and fees. Spirit publicly lashed out by posting on their website, "Warning. New government regulations require us to HIDE taxes in your fares. This is not consumer friendly or in your best interest. It's wrong and you shouldn't stand for it." Spirit Airlines then in an effort to once again mislead the public shows after purchasing a ticket the airlines ticket cost and fees. Instead of showing the complete break down as the regulation requires the consumer must then click on a link to see the breakdown of the taxes and fees. In addition, the carrier has now included a new $2 charge. Spirit Airlines stated, ?To cover the costs of this misguided and expensive regulation, Spirit is introducing the $2 DOTUC fee. The $2 fee to cover the unintended consequences of government regulations goes into effect on Tuesday, January 31, 2012.? ?The U.S. Department of Transportation's new supposedly "consumer friendly" regulation requiring airlines to hold fares for 24 hours after booking without penalty comes with unintended consequences and is costing consumers millions.? ?While this may appear to be a consumer-friendly rule at first, the USDOT has ignored the cost impact to consumers. As the transparency leader, Spirit believes that consumers have a right to know that this misguided regulation is expensive and is hitting consumers directly in their pocket books. 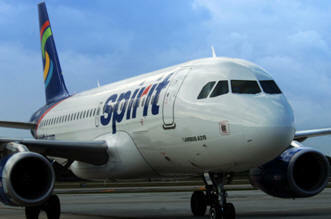 Spirit believes low fares are what help consumers most.? "People love the idea of not having to commit to a reservation, but this regulation, like most, imposes costs on consumers," says Spirit President and CEO Ben Baldanza. "Wouldn't we all like to eat all we want and not get fat? Regulators like to try to sell the idea of this rule, but have ignored the cost impact to consumers. You simply can't eat all you want without consequences." ?This rule mandates that we take out seat inventory for those who may or may not decide to pay for it. This prevents us from selling these seats to someone who definitively wants to book their reservation and leads to seats not being filled. The consequence is that we must spread costs over fewer customers, thus raising the cost for all passengers.? In 2009, Spirit Airlines was hit with record fine of $375,000. The airline was fined for failing to comply with DOT regulations in which the carrier had denied boarding compensation, mislead fare prices and baggage liability. The carrier bumped passengers from oversold flights without compensating passengers and didn?t provide written notices of passenger?s rights as required by law. The airline violated DOT rules requiring airfare ads to state the full price by omitting carrier-imposed fees from the base fare. Spirit also violated DOT rules by failing to retain copies of consumer complaints and by failing to file required reports in a timely manner, the DOT added. Spirit spokeswoman Misty Pinson said, ?Selling fares for $9 has made us very popular and, a few years ago when we adopted this model, we had some growing pains during the transition. We have addressed all the core issues that caused customer experience challenges a few years ago, including upgrading our computer systems and utilizing a new reservations partner.? Department of Transportation Secretary Ray LaHood recently said, ?This is just another example of the disrespect with which too many airlines treat their passengers, Rather than coming up with new and unnecessary fees to charge their customers, airlines should focus on providing fair and transparent service that's what our common sense rules are designed to ensure." DOT's top lawyer sent a letter to Spirit Airlines criticizing the airline's statements on the pricing regulations. "The rule does not prevent carriers from disclosing the amount, type, and nature of government taxes and fees." The air carriers do have allies in congress. Rep. Tom Graves announced he will introduce legislation to cancel Department of Transportation (DOT) airline consumer rules which will include the Tarmac Rule. Airline Tarmac Delays rule prohibits U.S. airlines operating domestic flights from permitting an aircraft to remain on the tarmac for more than three hours without deplaning passengers. This was a result of such cases as United Flight 270 when passengers were stranded on the tarmac nearly nine hours. United Continental Airlines? CEO called the Tarmac Rule stupid. In 2008, Spirit Airlines had the highest number of complaints per passenger among U.S. airlines as reported by Bureau of Transportation Statistics.